Panasonic TX-50EX750B review | What Hi-Fi? As far as unique selling points go, a pedestal stand with adjustable height doesn’t seem especially thrilling, particularly if, as is the case here, it’s a rather inelegant, labour-intensive feature. It’s a good job, then, that the Panasonic TX-50EX750B has more to offer than a bizarrely low-tech height-adjustment function. But can it compete with the best televisions in its class? If weight was a measure of success, the TX-50EX750B would be an instant winner. It weighs 22.5kg, which is an incredible amount for a 50in TV. A huge portion of that weight is in the metal stand, which not only gives the TV a solid, cross-shaped footprint, it also extends up the back of the TV to give it a giraffe-like, extendable neck. Being able to adjust the height of the screen is a nice idea, but doing so here involves lying the TV down then disassembling, moving, and reassembling part of the stand. While the height adjustment is of limited usefulness, this is a fairly snazzy TV. The thin silver bezel gives the telly a classy note, and the glossy, cross-shaped pedestal looks smart and offers a solid footing too. Turn the telly on and you’re presented with some straight-laced set-up menus. There’s none of the welcoming colour or slickness that you get from an LG or Samsung TV. Initial installation is quick and straightforward, though, and before long you find yourself dealing with the Firefox-based operating system proper. This, too, is a bit of a mixed bag: it’s all built around three main areas (Live TV, Apps and Devices), but the actual menu structure is a bit odd and some menus and features overlap in a way that can be confusing. Still, you will get used to it, particularly if you take a little bit of time in the first instance to pin your favourites to a special shortcut menu. And there are lots of features to enjoy, too. There’s Freeview Play on board, and dedicated apps for all of the expected catch-up channels, too. The TX-50EX750B will also play Blue Planet II in 4K HDR via the iPlayer app. You also get Netflix and Amazon Prime Video, both in 4K HDR form, so there’s plenty of HDR content here. And while Dolby Vision isn’t supported, HDR10+ is on the way via a firmware update and HDR10 and HLG are there out of the box. Our first port of call is a 4K HDR Blu-ray of Guardians Of The Galaxy Vol.2. It’s fast becoming a favourite thanks to its stunning colours and rapid action, and the Panasonic does a pretty good job with it. Motion, in particular, is extremely impressive here, with the Intelligent Frame Creation reducing blur without introducing any of that unpleasant soap opera effect. In fact, only Sony marginally betters this Panasonic for motion. The EX750B delivers plenty of punch, with the film’s first fight scene proving a dazzling feast for the eyes. As lasers fire across the screen, the tentacle monster breathes deadly rainbows at the darting Guardians and the bright, neon credits appear on screen. But there’s something missing. The image is bright, but it’s clear that black depth has had to be sacrificed, and the effect is less overall contrast than rival TVs offer. This impacts on almost all aspects of the image: it looks a bit flatter, with the dark elements that contribute to solidity not quite dark enough. Colours are bright, but not particularly lush or vibrant, and details aren’t emphasised as they are on other sets. It’s just a less engaging and enticing image compared to the best in class. The uneven backlighting on our review sample doesn’t help either. The Panasonic is a little lacking when it comes to fine details and nuanced shading, too, with faces missing the realism and subtlety available elsewhere. We’re not saying this is a bad 4K HDR performance, but the picture doesn’t pop or sizzle as you might expect. With 1080p the EX750B is actually much closer to its competitors. Detail levels are high by Full HD standards, with all of the grime and sweat visible on Bond’s face in the aftermath of Quantum Of Solace’s opening car chase. Colours here are natural and balanced, with skin tones now subtler and more realistic, and motion is once again excellent. The picture is a bit subdued, though, with Siena looking more overcast than sweatily hot, and the lights in the tunnels beneath Piazza del Campo looking less bright than they should. There’s some detail missing in the dark parts of the image, too, with the brickwork less distinctly drawn and the shoulder of Bond’s suit blending into the shaded background a little more than it should. While the Panasonic lacks some of the sparkle of its rivals, it’s natural, neutral balance, strong detail and excellent motion processing make it a strong screen for Full HD. Drop down to standard definition via the aerial or satellite tuners or from a DVD, and that natural touch makes for a surprisingly pleasant image. There’s a little more fuzz around edges than the very best can muster, but this is a clean, controlled image by SD standards. If you’re a gamer you’ll be a little bit disappointed to discover that Game Mode is rather buried in the menus and doesn’t have a shortcut button, but also pleased to hear that we’ve measured input lag at a very impressive 26ms. That’s more than fast enough to be completely unnoticeable. We always recommend partnering your new TV with a separate sound system if possible, and that’s most certainly the case with the Panasonic EX750. This isn’t a terrible-sounding set, and its built-in speakers are relatively balanced and clear, but its presentation is quite narrow and congested, offering none of the spaciousness or punch of the best flatscreens around. There is a Surround mode, but this doesn’t open the soundstage up as much as you’d expect. The Panasonic TX-50EX750B is a likeable TV that offers a natural, consistent performance across all sources and looks smart while doing so. But it also lacks both the sparkle and subtlety of the best TVs around. 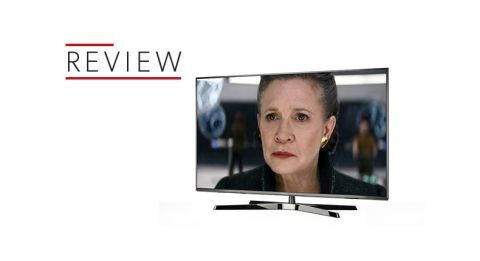 At £850 it’s certainly not bad value, but at this point in 2017 there are discounts available on loads of premium TVs. For example, the Award-winning Sony KD-49XE9005 is available for £1000 or less if you shop around, and while that is more than you’d pay for the Panasonic, it’s well worth the extra money.